Once you’ve succeeded in cooking a lobster tail, you now have to tackle the adventure of eating it cleanly. 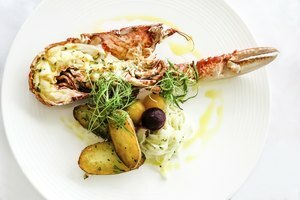 While eating with your hands is par for the course for a classic East Coast lobster dinner, lobster tails are often presented more elegantly, requiring the use of cutlery. 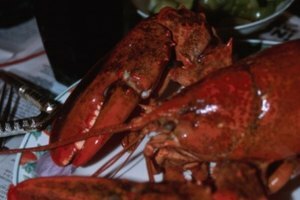 Eating a lobster tail means cracking the shell – if necessary – and removing the tail meat, either in one piece or cut into pieces in the shell. Cracking a cooked lobster tail is necessary if the tail has been cooked whole, without butterflying or splitting. To crack a lobster tail, take a lobster or crab cracker and place the tail sideways in the fold of the cracker, so the hard shell is facing the joint of the cracker. Carefully press down on both handles of the cracker, splitting the tail shell. 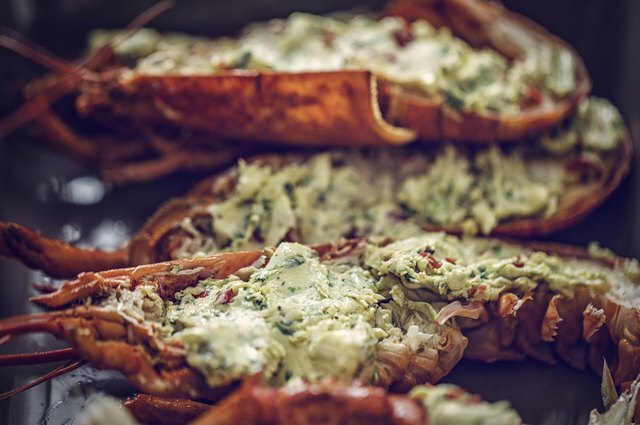 You can also use a pair of kitchen shears to cut through the soft under-shell of the lobster. Cut along both edges to peel off the carapace, revealing the tail meat. 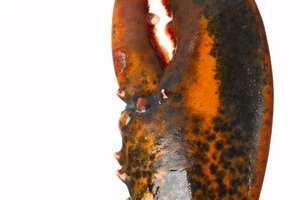 If the lobster tail has been butterflied prior to cooking, the tail meat can be removed whole. Insert your lobster fork between the sections of the tail fan, securing it between segments. Push the tail meat away from the tail fan, and, if properly cooked, the tail meat should slide out easily, in one piece. In some cases, butterflied tail meat can also be cut with a knife and fork in small pieces until you reach the fan of the tail. This meat can then be removed in a similar fashion. Halved lobster tails have been split entirely in two, making for easy removal. The tail meat can be lifted directly out of the shell with a fork or, if you wish, you can cut the tail meat in the shell into bite-size portions before eating. 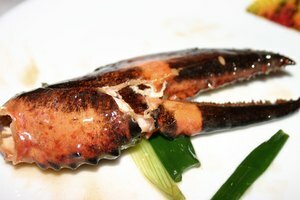 If the lobster tail was split and then stuffed, it is recommended to eat the tail meat inside the shell, as removing the meat and stuffing can be difficult and messy. 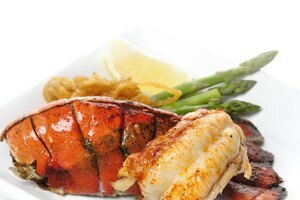 Lobster tail is often served with dipping sauce on the side. The classic option is clarified butter, butter with the milk solids removed, but mayonnaise, hollandaise and spicy tomato sauce can also be served as accompaniments. Dip the tail meat in any sauce after it has been cut into bite-sized portions. Leftover tail meat can be used to make lobster rolls or added to salads for a fast, light, meal.